locker meaning | German is easy! It looks an awful lot like to lock. But that doesn’t mean that they’re related. I for instance look an awful lot like Chris Hemsworth, and yet we’re not related either. We’re just both very, very attractive – a walking temptation. And that’s actually kind of what locken is all about. 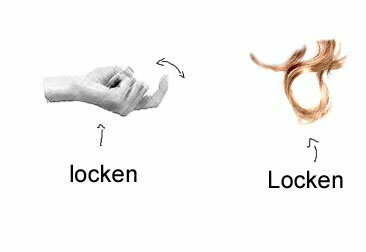 And not only the verb locken. The noun Locken can be attractive, too, if you like curls. Oh and let’s not forget about locker, which is also pretty attractive.